Barbie Video Girl Features A Built-In Camcorder – But Where's The Ken Version? | OhGizmo! Barbie Video Girl Features A Built-In Camcorder – But Where’s The Ken Version? Besides pursuing a career as a computer engineer, it seems Barbie is also considering espionage as a side gig. 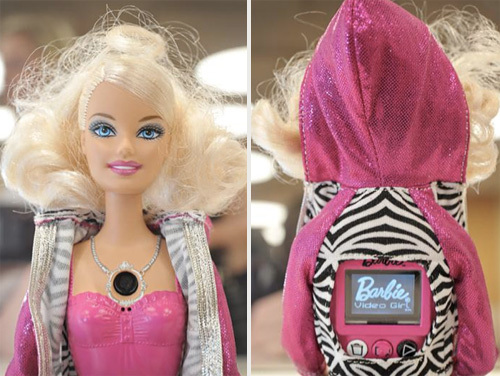 The Barbie Video Girl Doll, which was just unveiled at Toy Fair, features a video camera ‘hidden’ in Barbie’s necklace that can capture up to 30 minutes of footage. But what’s more disturbing is the LCD display fused to her back that allows you to play back those videos. Now I know Mattel has never been that concerned with anatomical correctness in the Barbie line, but I’m pretty sure they’re taking some real creative licenses here. There’s also a USB port hidden somewhere on the doll, not exactly sure where, that allows the videos to be downloaded to a PC and/or uploaded and edited on Barbie.com. The whole idea just seems kind of creepy to me, probably even more so if there was a Ken version, but don’t let me stop you from picking one up in July when they’ll be available for about $50. I suppose it would be a cute idea if your little girl wanted to record her conversation with her doll. As a mother of 2 little girls myself i was shocked with this barbie release; very very creepy to think anyone can buy this toy with hidden camera with full 25minutes of video that connects to a computer. I would not get his for my girls, they are not allowed to have a computer cam and a barbie doll does not make an exception. I can understand a toy video camera concept to record your little ones and they can record themselves but hidden in a doll just sounds off all kinds of alarms….. i am almost certain this one will come back to haunt us sometime soon in the news.